The world is at war. If you don't believe this then look at what kind of money is being spent on the military and civil defense industries. Even more frightening are the man caused "natural disasters" (oil spills, rising ocean level), That means we need to be creative and productive in order to outflank the destructive forces. Thanks to D & D at Empower Network, regular people like us have the power of big CEO's at our fingertips. That's not enough, they even coach us for success and give us money for doing what?.. almost nothing! The ultimate secret is to get Rabbi Nachman buried in Jerusalem and to follow him from Uman to Jerusalem, that would place you on the top of the top levels of all the Universe! Be a real FAN OF RABBI NACHMAN! I never wanted to leave the village settlement I founded in the Judaen hills overlooking Jerusalem. But an Empower event is worth it. My mother survived a failed assassination attempt, and the assassin is now dead (by an act of G-d), to give you an idea of how hot it is here and why you don't want to leave the grounds unattended. Except to throw your support behind, and lock arms at Empower. Being in the trenches in the spearhead makes you understand the strategic importance of bringing Rabbi Nachman to Jerusalem. No matter how much security and technical advancement we "sponsor" the problems will not be solved until people improve what is going on inside their head. RABBI NACHMAN can really do that, but only once he is positioned near King David, in the Holy City. Call it mystical if you want. There is now an Israeli Party in the Knesset dealing with this issue. 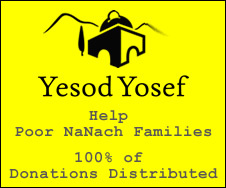 I am asking you to please ask your friend to sign up as supporters of this cause for bringing Rabbi Nachman to Jerusalem. I will try to bring you my blessings on a monthly basis at no charge. Feel free to send me questions or suggestions and I will try to answer you as best I can. Could you post your email address?